Veteran Carli Lloyd, star of the 2015 Women's World Cup, scored twice for the United States on a night that honored the 1999 champions. Between Alex Morgan's milestone and Mallory Pugh's scoring prowess, the USWNT's win over Australia was crucial in more ways than one. In his first comments since a gender discrimination lawsuit was filed against the U.S. Soccer Federation by 28 members of the women's national team player pool, president Carlos Cordeiro said U.S. Soccer believes all female athletes deserve equal pay. Tierna Davidson hopes skipping her final college season to play in the NWSL will better prepare her for a spot on the U.S. roster and the World Cup. Alex Morgan, whose 18 goals led the U.S. national team to an 18-0-2 record and a spot in next year's FIFA Women's World Cup, was named U.S. Soccer Female Player of the Year. The U.S. Olympic Committee has dismissed a complaint by former U.S. women's national team goalkeeper Hope Solo that accused the U.S. Soccer Federation of illegally favoring Major League Soccer. 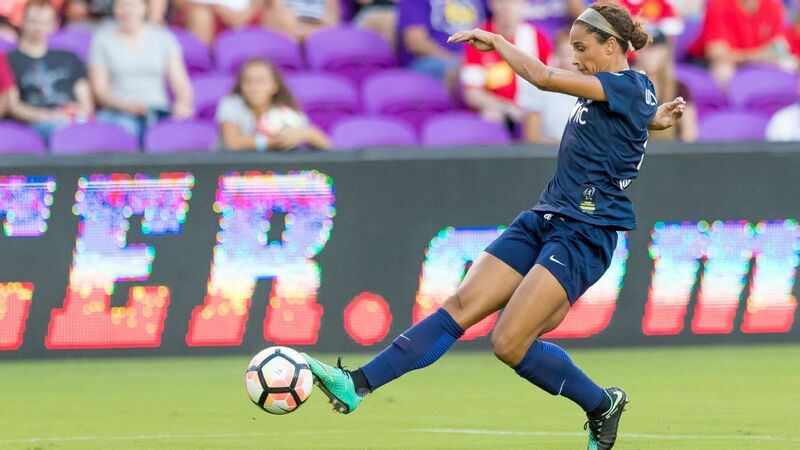 espnW's Julie Foudy examines how the legend of Marta, a five-time FIFA Player of the Year, has grown despite the struggle for equality in her native Brazil. U.S. women's national team star Carli Lloyd has been acquired by Sky Blue FC in a three-team trade also involving veterans Samantha Kerr and Christen Press. Seven-year-old Alex Ibarra raffled off a signed jersey from his favorite player, Christian Pulisic, to help raise money for Puerto Rico aid. When Pulisic heard what happened, he decided to step up in a big way. U.S. Soccer star Megan Rapinoe and four-time Olympic gold medalist Sue Bird spoke about their influence on each other and more at the eighth annual espnW: Women + Sports Summit. John Langel helped U.S. Soccer and the U.S. women's hockey team make strides toward pay equity. But while the athletes are doing all they can, the attorney said it's time for corporations to step up. High school basketball player Charli Collier, U.S. women's soccer star Mallory Pugh and two-sport Boston College senior Kenzie Kent discussed their young careers at Monday's Voices of the Future panel at the espnW: Women + Sports Summit. To an outsider, the place-kicker's breakthrough debut might seem like some random occurrence, a fluke. His Raiders teammates know otherwise. Megan Rapinoe, who leads the NWSL with 12 goals and starred for the U.S. Women's National Team in the Tournament of Nations, will miss five weeks after having knee surgery. The Netherlands became women's European champions for the first time with Sunday's thrilling 4-2 victory over Denmark on home soil. As professional athletes married to each other, Zach and Julie Ertz provide support and inspiration through competition. Just days before their wedding, Eagles tight end Zach Ertz and USWNT defender Julie -- a World Cup winner -- posed for the Body Issue and talked competition, support and body confidence. Dom Dwyer speaks about a "solid team performance" and his goal that guided the United States to a 2-1 win over Ghana in East Hartford. The bench and stands celebrate as Dom Dwyer gives Team USA a 1-0 lead in their friendly against Ghana. Before the kickoff between United States and Ghana, soccer fans gathered for a pre-match tailgate at Rentschler Field in East Hartford. Alex Morgan limped out of Saturday's 3-0 win over Paris Saint-Germain, the team that Lyon will face in the Champions League final on June 1. "I ran into Pep a few times on the elevator in our apartment complex," Carli Lloyd said, adding that Pep Guardiola had texted her good luck wishes. Washington State safety Shalom Luani scored a goal for American Samoa in a World Cup qualifier, but he passed on soccer to pursue football. The Raiders, who have the fourth-toughest strength of schedule in the NFL, will be on prime time a franchise-record five times in 2017.